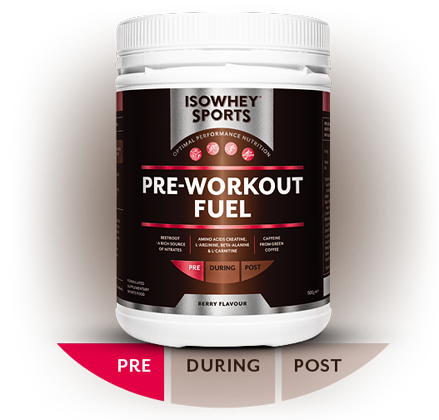 A scientifically researched formula that contains unique ingredients to support exercise performance. Amino acids creatine monohydrate, L-arginine, beta alanine and L-carnitine provide energy to support the body during strenuous exercise. Also contains beetroot as a natural source of nitrates, caffeine from green coffee, and Panax ginseng. Nitric oxide is involved in the dilation of blood vessels which enables adequate blood flow and tissue oxygenation to all organs including the muscles, heart, lungs and brain. Optimal circulation means optimal delivery of oxygen and nutrients, and therefore optimal performance. • Contains beetroot juice for its nitrate content which, when converted into nitric oxide, is involved in blood vessel relaxation and tissue oxygenation. • Contains green coffee for a natural source of caffeine and Panax ginseng. • Creatine provides energy to support contracting muscles during anaerobic exercise. • L-arginine is a precursor for nitric oxide. It is involved in the secretion of endogenous growth hormone, and helps detox the body of lactic acid and ammonia. • L-carnitine assists in the transport of fat across cell membranes for use as an energy source for heart and skeletal muscles. • Contains the amino acid beta-alanine, an antioxidant that acts to buffer acidity in the body produced by high intensity exercise. • Taurine is involved in muscle contractility in both skeletal and cardiac muscles. It helps exercising muscles rid itself of lactic acid, helping muscles to work for longer periods. • Includes coenzyme Q10, required for ATP/energy production. • The antioxidant pomegranate is a natural source of potassium and vitamin C.
Mix 1 serve (1 heaped scoop = 10g) into 200mL of cold water. Consume once daily. INGREDIENTS: Creatine monohydrate, maltodextrin, beta-alanine, L-arginine monohydro- chloride, sweeteners (xylitol, steviol glycosides), beetroot juice powder, natural flavours, food acid (citric acid), green coffee extract (Coffea arabica), L-carnitine tartrate, ginseng root powder (Panax ginseng), pomegranate powder, L-taurine, microcrystalline cellulose, silica anhydrous, coenzyme Q10. WARNINGS: Not to be used as a sole source of nutrition. Should be used in conjunction with a balanced diet and appropriate exercise program. Not suitable for children under 15 years of age or pregnant women: Should only be used under medical or dietetic supervision. Contains 100mg caffeine per serve. Contains xylitol: Excess consumption may have a laxative effect.